Top 10 most unhealthy, cancer-causing foods - never eat these again! 1) Genetically-modified organisms (GMOs). It goes without saying that GMOs have no legitimate place in any cancer-free diet, especially now that both GMOs and the chemicals used to grow them have been shown to cause rapid tumor growth. But GMOs are everywhere, including in most food derivatives made from conventional corn, soybeans, and canola. However, you can avoid them by sticking with certified organic, certified non-GMO verified, and locally-grown foods that are produced naturally without biotechnology (http://www.naturalnews.com). 2) Processed meats. Most processed meat products, including lunch meats, bacon, sausage, and hot dogs, contain chemical preservatives that make them appear fresh and appealing, but that can also cause cancer. Both sodium nitrite and sodium nitrate have been linked to significantly increasing the risk of colon and other forms of cancer, so be sure to choose only uncured meat products made without nitrates, and preferably from grass-fed sources (http://www.organicconsumers.org/foodsafety/processedmeat050305.cfm). 3) Microwave popcorn. They might be convenient, but those bags of microwave popcorn are lined with chemicals that are linked to causing not only infertility but also liver, testicular, and pancreatic cancers. The U.S. Environmental Protection Agency (EPA) recognizes the perfluorooctanoic acid (PFOA) in microwave popcorn bag linings as "likely" carcinogenic, and several independent studies have linked the chemical to causing tumors. Similarly, the diacetyl chemical used in the popcorn itself is linked to causing both lung damage and cancer (http://www.drweil.com/drw/u/QAA400701/Microwave-Popcorn-Threat.html). 4) Soda pop. Like processed meats, soda pop has been shown to cause cancer as well. Loaded with sugar, food chemicals, and colorings, soda pop acidifies the body and literally feeds cancer cells. Common soda pop chemicals like caramel color and its derivative 4-methylimidazole (4-MI) have also specifically been linked to causing cancer (https://www.naturalnews.com/031383_caramel_coloring_cola.html). 5) 'Diet' foods, beverages. Even worse than conventional sugar-sweetened soda pop, though, is "diet" soda pop and various other diet beverages and foods. A recent scientific review issued by the European Food Safety Authority (EFSA) of more than 20 separate research studies found that aspartame, one of the most common artificial sweeteners, causes a range of illnesses including birth defects and cancer. Sucralose (Splenda), saccharin and various other artificial sweeteners have also been linked to causing cancer (http://www.dailymail.co.uk). 6) Refined 'white' flours. Refined flour is a common ingredient in processed foods, but its excess carbohydrate content is a serious cause for concern. A study published in the journal Cancer Epidemiology, Mile Markers, and Prevention found that regular consumption of refined carbohydrates was linked to a 220 percent increase in breast cancer among women. 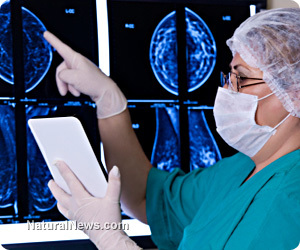 High-glycemic foods in general have also been shown to rapidly raise blood sugar levels in the body, which directly feeds cancer cell growth and spread (https://www.naturalnews.com/001812_cancer_prevention.html). 7) Refined sugars. The same goes for refined sugars, which tend to rapidly spike insulin levels and feed the growth of cancer cells. Fructose-rich sweeteners like high-fructose corn syrup (HFCS) are particularly offensive, as cancer cells have been shown to quickly and easily metabolize them in order to proliferate. And since cookies, cakes, pies, sodas, juices, sauces, cereals, and many other popular, mostly processed, food items are loaded with HFCS and other refined sugars, this helps explain why cancer rates are on the rise these days (https://www.naturalnews.com/038071_cancer_sugar_sweets.html). 8) Conventional apples, grapes, and other 'dirty' fruits. Many people think they are eating healthy when they buy apples, grapes, or strawberries from the store. But unless these fruits are organic or verified to be pesticide-free, they could be a major cancer risk. The Environmental Working Group (EWG) found that up to 98 percent of all conventional produce, and particularly the type found on its "dirty" fruits list, is contaminated with cancer-causing pesticides (http://www.ewg.org/foodnews/list/). 9) Farmed salmon. Farmed salmon is another high-risk cancer food, according to Dr. David Carpenter, Director of the Institute for Health and the Environment at the University of Albany. According to his assessment, farmed salmon not only lacks vitamin D, but it is often contaminated with carcinogenic chemicals, PCBs (polychlorinated biphenyls), flame retardants, pesticides, and antibiotics (http://www.albany.edu/ihe/salmonstudy/pressrelease.html). 10) Hydrogenated oils. They are commonly used to preserve processed foods and keep them shelf-stable. But hydrogenated oils alter the structure and flexibility of cell membranes throughout the body, which can lead to a host of debilitating diseases such as cancer. Some manufacturers are phasing out the use of hydrogenated oils and replacing them with palm oil and other safer alternatives, but trans fats are still widely used in processed foods (https://www.naturalnews.com/010095_hydrogenated_oils_unhealthy.html).